Restore discolored boots with a dye kit. Discoloration can make your leather or suede boots look old, worn out and ruined. 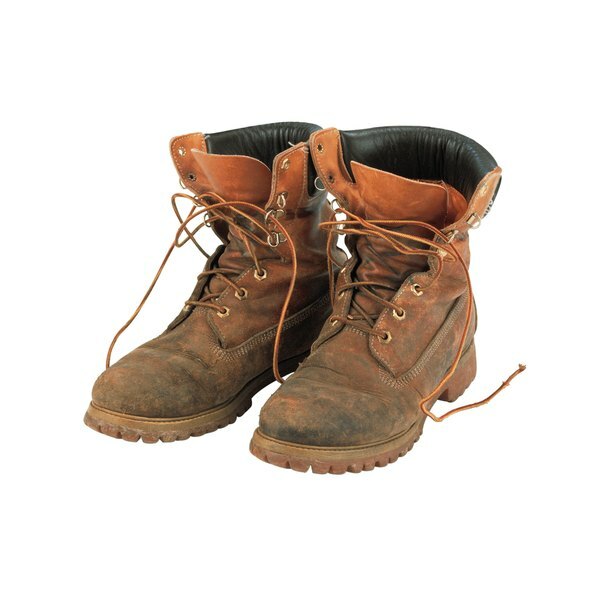 In cases of severe discoloration where large patches of the leather or suede are faded or discolored, you may need to take your boots to a professional shoe repair shop to have the damaged areas restored to their former shade. However, if the discoloration is minor, and if you're willing to try, you may be able to successfully restore your discolored boots at home with a few supplies. Clean your boots thoroughly using water and a clean towel. It’s possible that the discoloration is caused by caked-on dirt. Let your boots dry completely. Purchase a leather or suede dye kit in the color of the nonfaded areas of your boots. Choose the appropriate kit for the material your boots are made of. Dye kits can be purchased online or at local shoe stores. Follow the instructions provided in the dye kit to restore the proper color to the discolored areas on your boots. Spray your boots with leather or suede protector spray to prevent future discoloration. When purchasing dye, bring your boots with you to ensure a color match. Test a small spot on your boots to ensure that the dye is the right color.